My this year’s take on Purim treats, hamantaschen, are savoury, dairy free and vegan bagels packed with goodies! 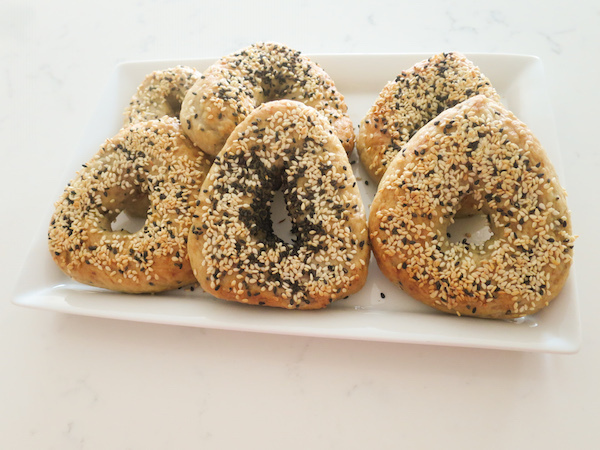 Sesame seeds and quinoa bagels 😀 They are an absolute treat and really not difficult to make! 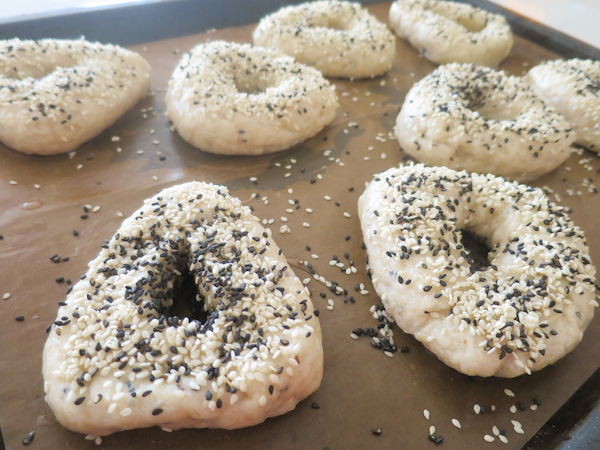 I used flour mixture of plain wheat and whole wheat rye flour and sesame seed mixture of white and roasted black sesame seeds. 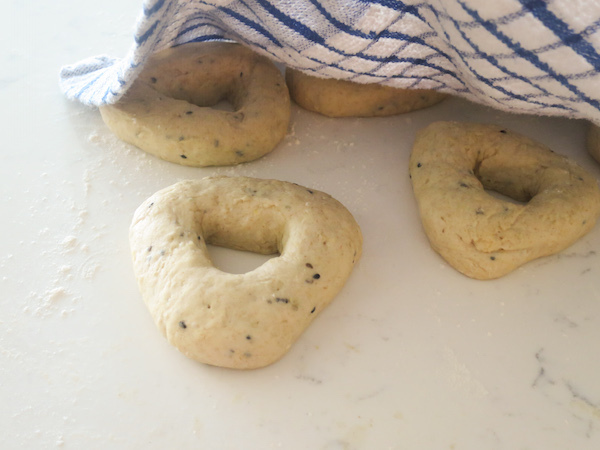 Black sesame seeds and rye bring more colour and jump up the nutritional values too. You may wonder what quinoa has to do in this recipe, well in addition of being super healthy, it’s making the texture of the bread softer. Quinoa is currently in the top 3 food items I’m excited about, together with New Zealand Spinach and Hemp Oil. I practically use these items daily – spinach in salads, sandwiches, smoothies, hemp oil in smoothies and quinoa in pizza, salads and bread. I’m some sort of foodie – a picky eater that gets excited about few healthy food ingredients at time. 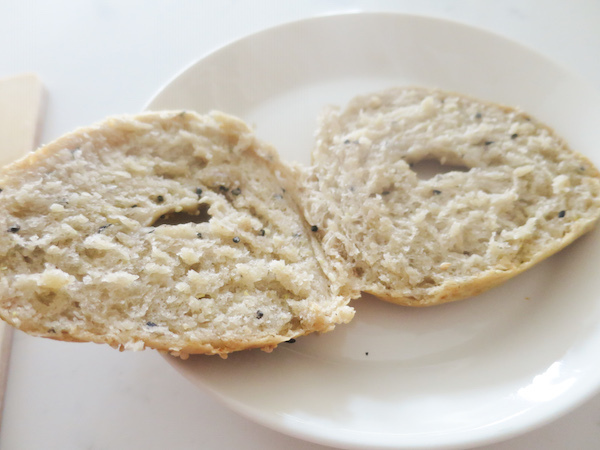 I prefer eating bagels straight from the oven, when they are still crispy from outside and soft and warm inside. When they cool they tend to harden a bit, however this dough is soft and they’ll stay lovely soft to the next day. Alternatively you can freeze them in airtight bags and toast when thawed (you’ll need to clean your toaster afterwards from all those sesame seeds). Fill with your favourite fillings and enjoy! For all you vegans out there – we’ve tested them with vegan cheese and veggies and they were absolutely divine! If you do try this recipe, we’d love to hear how they turned out!! Let us know in comment below or on our Facebook page. 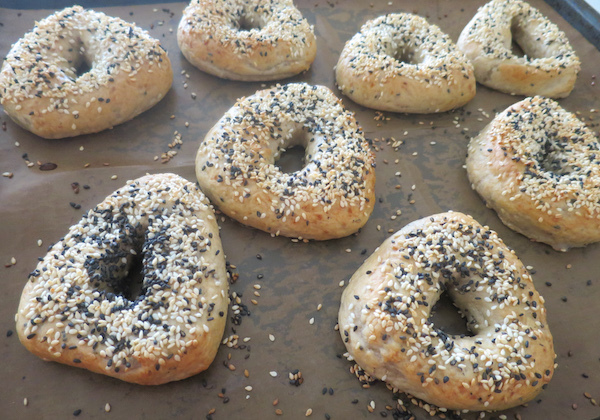 Dairy free vegan sesame seed and quinoa bagels baked into triangular, Hamantaschen shape for Purim! In a mixing bowl dissolve yeast into lukewarm water and mix well. 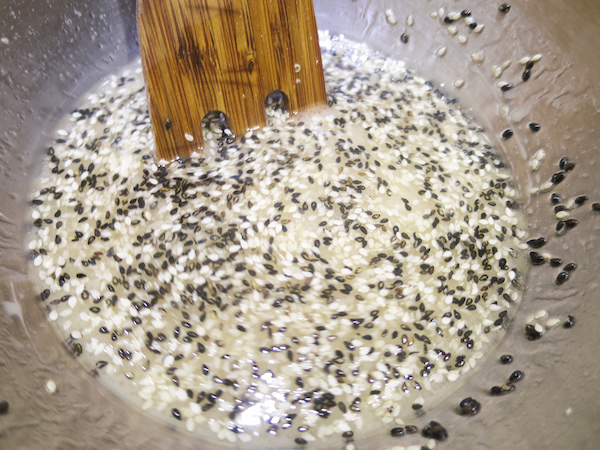 Add sugar, salt, quinoa, 50 ml (1.7 oz) oil and half of the sesame seeds and mix with a wooden fork. Gradually add the flour while continuing to mix with the wooden fork until you can work it with your hands. Knead until soft and elastic, remove from the bowl and oil the bowl. 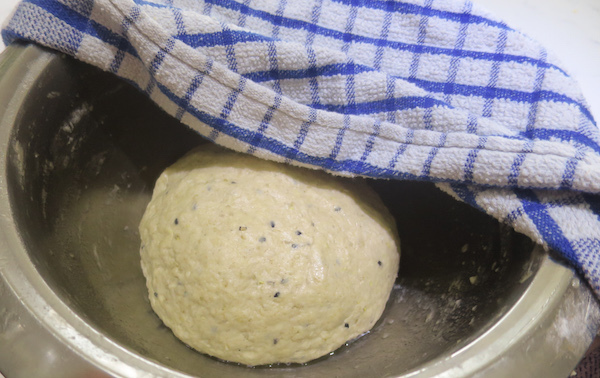 Return the dough in oiled bowl, cover with kitchen towel and allow to rise in warm until it has doubled in size, for about 40 minutes. Preheat oven to 250°C (482°F) and line a baking sheet with parchment paper. 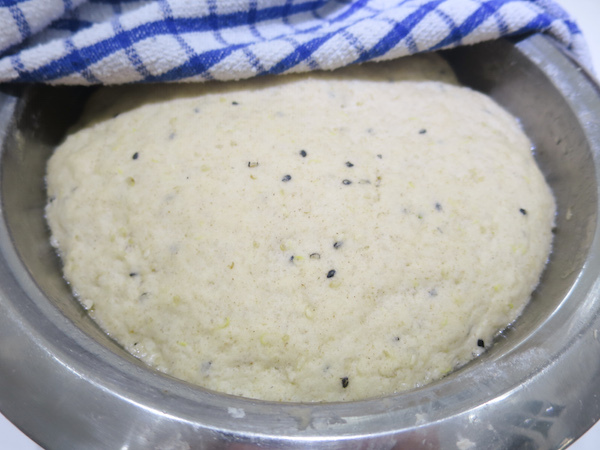 Remove risen dough from the bowl and knead again on lightly floured surface. 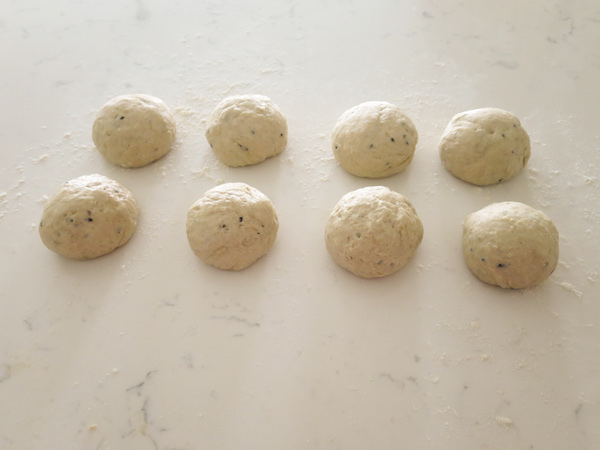 Divide the dough and shape into 8 balls. Make a hole in the middle of each ball with your index finger spinning around to make a hole about 2 cm wide, for hamantaschen version shape into triangular, and cover with a kitchen towel. 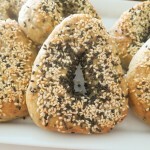 While the bagels are covered and rising, bring water to boil and add sugar. 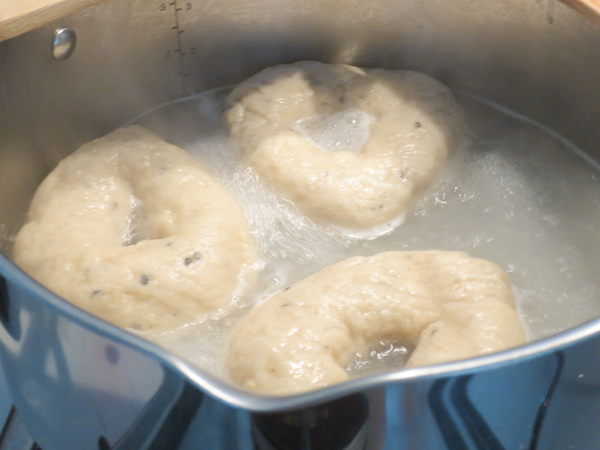 Slip the bagels in the boiling water 2-3 at time. Cook for about 2 minutes turning the bagels around in the water once a skin has formed. Place on prepared baking sheet and sprinkle sesame seeds on top. Bake in preheated oven for 15-20 minutes until browned and crispy. Serve hot or at room temperature with filling of your choice. 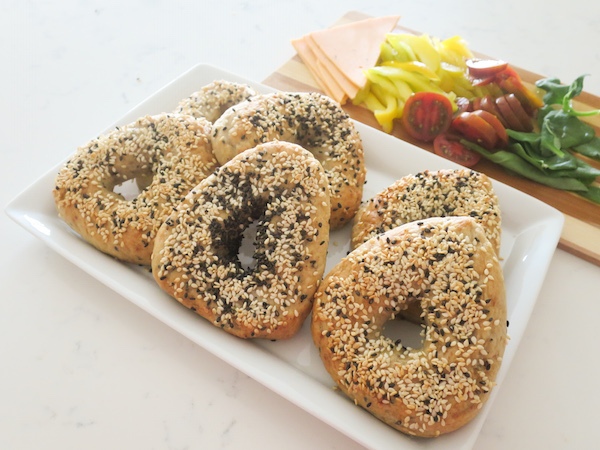 Bagels are best consumed within 3-4 hours after baking.